North & South Korea exchanged fire earlier today and the situation could rapidly escalate into a full global war with China supporting North Korea and the US and Russia supporting South Korea. Please let us all join in positive thinking in order to avoid such a disastrous outcome. 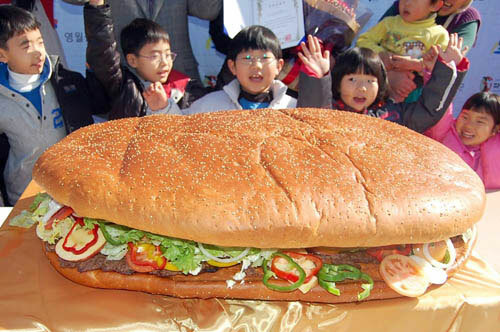 May South Korea's giant burger let both sides realize that burgers are better than wars and that all Koreans would be better off sharing a giant burger together. Let them also teach their children to Study War No More.